As diversity consultants, we get the opportunity to work with a range of private and public sector organisations, many of whom are at different stages of evolution when it comes to D&I practice. For the last couple of months, we have been fortunate enough to work alongside the Department of Conservation to deliver Unconscious Bias Awareness Training. Having delivered similar workshops in many other organisations, we have the opportunity to see what really works and what doesn’t and the approach that DOC has taken is worthy of a special mention. D&I Awareness sessions have been run country-wide, to socialise the D&I strategy and integrate it with business practices on the ground. This has created a line of sight for managers on what the overall aspirations are, and how the different regions and business units can contribute. Awareness training has been coupled with unconscious bias training, which has allowed participants to understand some of their own behaviours and how to be more inclusive in their leadership approach. The result is managers who are informed about the benefits of D&I, have the tools to be more inclusive and are empowered to put strategies in place to leverage the diversity of their teams. Awareness and training started with the Senior Leadership team, followed by senior managers and the wider business. This shows a real integrity in the approach and a willingness for business leaders to put their money where their mouth is. It has created a sense of joint accountability between managers and employees to building a more diverse and inclusive culture. 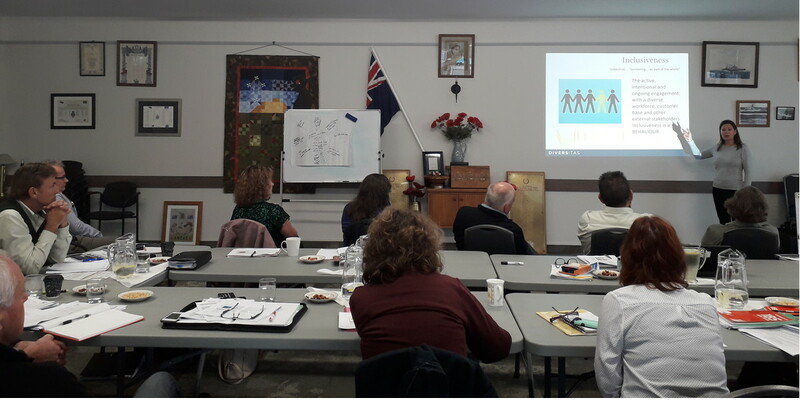 Training and awareness has been taken to the furthest reaches of the business, with sessions held in all DOC locations, from the bottom of the South Island, to the top of the North. In short, it shows a sincere commitment to having real conversations across the organisation, and to develop strategies which are tailored and appropriate for the different regions. Time and resources have been allocated to getting the message out there. Dedicated DOC representatives from the OD and HR teams have attended all the sessions, alongside the Diversitas consultants. This has helped to contextualise the training and sends a strong message to the business that there is a real commitment to moving things forward. Lou Sanson, the Director General, has committed resource, time and budget to increasing the diversity footprint and embedding inclusive practices across the organisation. His view is that “diversity is the people side of sustainability” and he is proud of the work DOC are doing to create an organisation where “our staff reflect the diversity of the communities that we serve” and to create an environment where “we listen to the ideas and suggestions of all our people, give everyone equal access to opportunities and encourage diversity of thought”. Feedback from the business indicates that managers have found that the training delivered so far has built their self-awareness and opened their minds, and will ultimately help them to build stronger teams. Diversitas is truly privileged to work with an organisation like DOC, who has a sincere commitment to building an organisation that is future-focussed and able to leverage the opportunities that New Zealand’s diversity of talent has to offer. Thank you DOC, for allowing us to share your approach with other organisations, so that together we can move forward to leverage all that New Zealand has to offer.